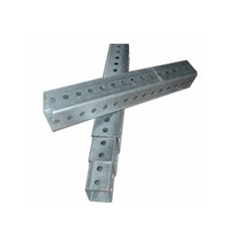 Perforated Square Tube | Telespar Sign Post System | BETTER SCREW CO.
Posts are manufactured from hot-dipped galvanized steel conforming to ASTM A653, G90 or G140. The posts are also coated with a chromate conversion coating and a clear organic polymer topcoat. Punching with 7/16" holes on 1" centers on all four sides down the entire length of the post. Five kinds of cross section including 1.50”X1.50", 1.75", 2.00", 2.25", and 2.50"X2.50"
Powder coated sign posts with all kinds of colors are also available.